Do you want to discover the world of Modelmaking while staying in a Natural Park in the North of Spain? Join us! Atelier La Juntana is a group of architects and artists developing Architectural Models and prototypes worldwide, working with international firms such as MVRDV and BIG. 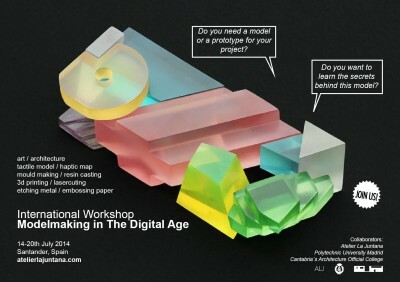 We produce models, investigate new possibilities and organise Fab-Lab and Model-Making Workshops. MMDA´14, Model Making in The Digital Age is a one week workshop investigating the relation between traditional craft and digital design. Throughout the course you will explore cutting-edge model making techniques while developing a personal model or prototype. The workshop consists of a theoretical and practical part led by tutors with different backgrounds, including architects and artists. During the course you will have full access to our workshop equipment and material: laser cuter, 3D printer, wood and metal workshop, resin and polyester casting, etched metal, embossing paper. Accommodation bed and breakfast, all practical materials, exhibition and publication of projects are included. Next workshop will take place in Santander, Spain, from 14th to 20th of July. Organised in collaboration with Polytechnic University of Madrid and Cantabria’s Architecture Official College, where the final exhibition will take place.